Each piece in the Kami series has a hand-forged and folded ASSAB-K120C powder steel blade, differentially tempered to produce an HRC60 edge, HRC40 back and a distinctive hamon. Saya are deeply lacquered in red, with a black ring-carved section at the sageo. The ray skin used on the tsuka is of the highest quality, and the tsuka-ito on the katana and wakizashi and the sageo on all three pieces are woven from best quality Japanese silk. 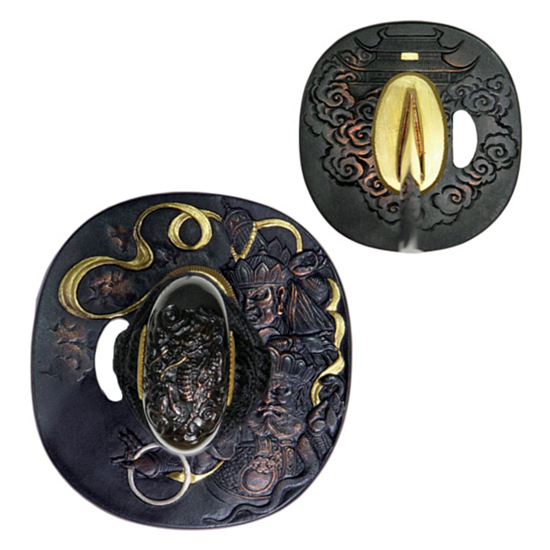 The fuchi, kashira, kojiri, koiguchi and kurigata are all made from blackened bronze, with decoration in relief and selective detailing of copper, silver and gold. The tsuba of the katana and wakizashi, depicting Kami (spirit guardian warriors) are made from hardened blackened copper with decoration in relief and selective silver and gold detailing. The habaki is of two-piece construction, the inner section being copper and the outer section gold-plated brass. The blades are engraved at the habaki with a hand-engraved "Fudo" horomono, a traditional blade carving from the Edo period. The blades of all three pieces are fullered on both sides, and each piece features a long kissaki. The Kami series consists of a matched katana, wakizashi, and tanto.